By Srinivas Chowdary Sunkara // petrobazaar // 8th April, 2019. Brent futures rose 94 cents or 1.35% to close at $70.34 and WTI futures advanced 98 cents or 1.58% to settle at $63.08 a barrel on Friday. Both the crude bench markers closed 5 months high and posted weekly gains. Shanghai crude oil futures remained unchanged while MCX crude futures in India edged Rs.28 up at Rs.4362 on Friday. Bullish U.S employment data which has dispelled some of the economic concerns, pushed U.S futures up. 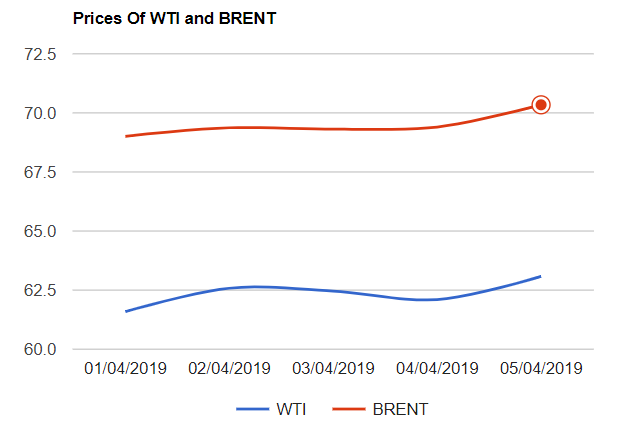 Escalation of fears over expected outage from Libya due to military action, Which may further tighten supplies also supported Brent futures on the week end. Potential slowdown of Venezuela's production as reported extended support to oil complex. Lingering concerns over delayed resolution from U.S-China trade talks limited the gains. U.S added 15 oil rigs into its drilling activities during the previous week as reported by Baker Hughes may weigh on OPEC efforts to cuts. Today, Asian markets are trading up at their five month's high levels. Good day.